You’ve asked for it and Mountain Buggy has listened and delivered. The NEW nano duo has hit stores and it is the perfect double stroller for the traveling family. We all love the mountain buggy nano stroller and now they’ve done it again and have made the double stroller version of the nano–it’s the nano duo! Have two kiddos and need to get around? The nano duo is a great option! The NEW nano duo has the same great features as the original nano stroller. Mountain Buggy took those features and made the nano duo, a premium side-by-side double stroller for on-the-go parents with have two littles. We’ve tested it and love it so much that we’ve chosen it as our Product of the Month! Here are 14 things we love about this stroller. Double strollers can be heavy, but not this stroller. When you are traveling or living in a big city, the last thing you want to carry around with you is a heavy stroller. You already have to carry around all of your things, your kid’s stuff and maybe even your kids. I love that the nano duo only weighs 20 lbs, which is about the same weight as my five and a half month old son. With it being so lightweight, it’s no problem carrying this stroller around–especially with it’s carry handle or with the shoulder strap. The nano duo is the smallest folded double stroller on the market. It’s dimensions are 20” x 28.7” x 11”. So if you’re limited on space while traveling, need to run a quick errand with your kids, or have limited storage space, this is the stroller you want! To fold the stroller all you have to do is press the two buttons on the inside of the stroller to fold down the canopy, then press the seats down to bring the stroller fully together. It’s a compact fold that also stands alone. If you are plan on carrying it folded up, secure the wrist strap around the handlebar to prevent it from unfolding. The fold on the nano duo is exactly like their original nano–quick and compact. For a side-by-side double stroller, these seats are roomy! The height of the seats are extra tall (26 in) and suitable for children up to 33 lbs. Your kids will feel comfortable and like they have plenty of space while strolling. Speaking of their seats, I love that they can easily recline with the pull of a toggle and that they adjust at the angle that you (or your baby) desire. To have the seat sitting up straight, pull the two straps apart to push up the toggle and voila! Your seat is upright and ready to go. I like how this double stroller has individual sunshade canopies over each seat and not just one large sunshade. The sunshades are also easy to operate and has a flip out visor for more coverage. When looking at all the of the sunshades, I saw that they have a range of different colors to choose from. I particularly loved this happy yellow color (called cyber), but if yellow is not your thing you can also choose silver, ruby, nautical, black, and their cool “year of the dog” pattern. Have you seen this storage basket? It’s massive! The nano duo storage bin can store up to 17.6 lbs of cargo so you can tote everything you need while buggying around. It’s nice to be able to adjust the leg rests to suit your child’s age and sitting needs. I love how these leg rests are padded and that each seat has its own adjustable leg rest. The nano duo has single action brakes with a color-coded pedal. They are super easy to operate since all you have to do is press to set and release the lock making them foot friendly no matter what footwear you choose to wear. Safety is always important and the nano duo’s harnesses are quality 5-point harnesses and have shoulder padding. The harnesses are easy to adjust and can be adjusted at different heights and even fit for the smallest of passengers. We all want a smooth ride. I really like how the nano duo was engineered with perfect weight distribution, allowing you to easily “pop” the front wheel up curbs and obstacles. When you’re out with your kids, more than likely you will come across a few bumps or curbs that you have to get over or around. This stroller has built-in rear wheel suspension and swivel or lock front wheel functionality, which makes it a breeze to push with one hand. 12. It’s Compatible for Newborns Too! The nano duo is compatible for newborns when used with the additional cocoon bassinet accessory. The stroller has a full lie flat solution that allows you to clip in the cocoon–which is a soft shelled, newborn carrycot. The cocoon is a great accessory to have for your tiny ones. It features a protective zip lid to shield your baby from the elements, detachable sunhood and carry handles. You can easily transport your baby in and out of the stroller without disturbing their rest. So if you have twins, travel a lot, and/or are limited on space, get two cocoons and this stroller and you will be set! Definitely two thumbs up for me! Obviously the cocoon is a cool accessory. There are other great accessories that you can get as well like the sun cover, the storm cover and the grab bar (just to name a few). 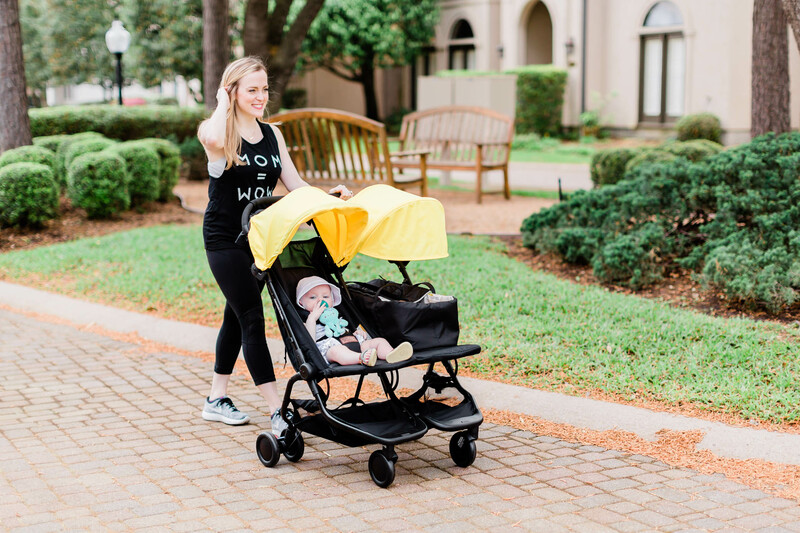 There is no doubt that the quality of the nano duo is a nicer and higher quality stroller than most umbrella stroller options. The fabrics, the frame, the design–everything is durable, strong and overall has been made nicely. I’m so glad and grateful that Mountain Buggy has taken the time to create this stroller for families that need a double stroller option of the nano. They nailed it and we couldn’t love it more!